For a place only about a 45 minutes’ drive outside of Sapporo, the fifth-biggest city in Japan (fourth-biggest if you lump Yokohama and Tokyo into the same conurbation that they are), Jozankei amazingly extricates itself from the fray of the here and now. Nestled in the mountains, on top of a renowned hot spring, the views and bone-consoling soaking are pleasures not to miss. Taking advantage of all this are a number of Japanese-style hotels, primarily constructed during the boom of the 1960s and the bubble of the 1980s. Luckily for us, hot spring soaking, mountain retreating, creature comforting, and deluxe dining are all timeless pleasures. Even more fortunately, there exists the Hotel Sankeien, expertly checking all the boxes without burning a hole in your pocket. Effortlessly attainable at as low as around 13,000 JPY (116 USD) for two people including dinner and breakfast, it’s an outright steal. In winter, or perhaps even in spring (it is Hokkaido after all! ), the mountains are covered with pretty snow. Naturally, in winter there’s skiing nearby, but summer brings its own ways to pleasantly idle away time, with walks along the river or hiking in the mountains being a couple of popular ones. Back at the hotel, you’ll be treated to views like the above from every room, and, for when the weather is a bit too chilly, the climate control to make it a more comfortable mountain-gazing experience. Traditionally, rooms at hotels like the Sankeien had futons laid out on the tatami (straw mat) floor for sleeping, but in recent years a number of both Japanese and foreign visitors have come to prefer sleeping on beds. The Sankeien gives you the best of both worlds, with comfortable beds to sleep on and a classic Japanese sitting area. Pour yourself a cup of tea (set provided) and relax at the low table before or after you bathe. Traditional, all-tatami rooms are also available. Did someone say hot springs? Jozankei exists first and foremost due to the discovery of a strong hot spring in the area. At the Sankeien, you can enjoy the hot spring’s bounty either indoors or in the ever-popular outdoor bath (don’t worry, you won’t be peeped!). Either way, unlike some lesser facilities on lesser hot springs, the onsen at Sankeien gives you unadulterated hot spring water, and a constant flow of it too – no recycled water here! Go ahead and enjoy the reputed health benefits (rheumatism, neuralgia or gastro-enteric disorders are said to benefit particularly well) with abandon. Keeping in mind how unbelievably reasonable your room with two meals cost, your expectations will be exceeded by the quality and taste of the dining offerings. You have a choice of Japanese or Western styles, but this snarky author suggests you go with Japanese since, well, you are in Japan. A well-balanced spread of vegetables, fish, soup, tofu, and other goodies will leave you satisfied without feeling heavy. Don’t come expecting Kobe style beef or whole crabs, but instead look forward to something closer to what locals would eat. This hotel harkens back to a time when lobbies were not just showpieces or tiny afterthoughts, but more comfortable places to just hang out. In addition to plentiful seating, there’s a bar that also happens to sell yummy ice cream, a gift shop loaded with well-priced souvenirs and snacks, and friendly staff at the ready. If you come as a group - a fantastic idea when coming to a hot spring hotel like this - you’ll find the lobby lounge areas to be a great place to nibble, sip, and gaze out into the wonderment. It could be the warm hot spring waters leading your correspondent into hyperbole, but malady or not, it’s a safe bet to say there are few places in Japan, let alone those so close to a big city like Sapporo, that provide rooms as nice as this, with more-than-solid meals, and access to a fabulous hot spring, all at a price like this. 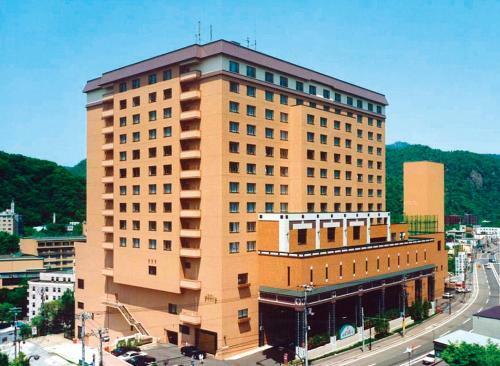 With free shuttle service to and from Sapporo Station, a night at Hotel Sankeien is a logical one-night extension to your trip, and it is one that you won’t forget.